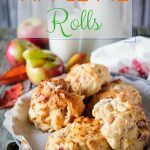 These Apple Pie Rolls taste like apple pie but without all the effort – delicious, pillowy and easy to make! Only a few ingredients, true One Bowl recipe! This post contains amazon affiliate links which means that if you purchase something after clicking one of those links, I will receive a small commission. I can’t believe it’s been almost two years since I first shared this recipe, it was originally posted on October 18, 2016. My baby was still just a baby. We’ve only been home for a few weeks after spending two months at the hospital. It was all new. It was all scary. She is two now and every day is challenging and exciting. I will be making these delicious Apple Pie Recipes very soon for her snack. I will most likely reduce the sugar even more or just omit it. She loves all baked goods and I love giving her fruit, so I’m sure these little Apple Pie Buns will be a hit with her. Fall is all about pumpkin. I see cakes and muffins and pies and cookies and pastas and lasagnas and meatballs all made with pumpkin all over the Internet. I, too, like cooking with it but I feel that apples also deserve their chance this season. Back in Russia pumpkin wasn’t popular (at least not in my family). I guess I tried it at some point but I can’t actually remember. The only pumpkin recipe that I heard of when I was little, was millet porridge with pumpkin and I’m pretty sure I never even tasted it. Apples, on the other hand, were always popular in Russia and they embody autumn season for me. Traditional apple pie with flakey crust and gooey filling wasn’t popular in Russia either. What we called pies were actually quick breads or single layer cakes. We made many of them in the fall. This quick and easy cake was a staple in my childhood. And apple pancakes. I don’t eat apples often and if I make that quick and easy cake it’s more often with peaches or nectarines, but fall still conjures my longing for apples and cinnamon. I imagine long chilly evenings spent with a cup of tea and a slice of apple pie playing solitaire (with real cards instead of computer) by a candlelight. Is it just my imagination or is it my memory? Memory of staying at our cottage with grandparents when I was little with no worries in sight. Memory of warmth and care. Memory of belonging and apples and candles. The smell of these Apple Pie Rolls brings that memory, that feeling back to me. My kitchen smells wonderfully spicy from cinnamon and deliciously sweet from all the delicious apples. 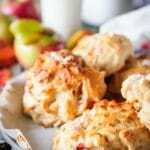 Want more Apple Recipes? Try these! The batter for these Apple Pie Rolls (or Apple Pie Buns?) comes together in a matter of minutes (like most recipes I make now), just mix all the ingredients in one bowl with a spatula and that’s it. There’s no oil, no need for butter to come to room temperature, no whisking or whipping required. It’s a true one-bowl recipe! The longest step is to chop apples and measure the ingredients, but even that shouldn’t take long. 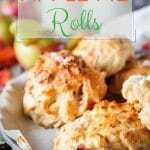 It takes only five minutes to mix these rolls up and then another 30-40 to wait for them to bake while your kitchen fills with the wonderful smells of apple pie and fall. What are the ingredients in the Apple Pie Rolls? These Apple Pie Rolls are made with a quick batter and there’s no oil, butter, or yeast. Are they Apple Pie Rolls or Apple Pie Buns or what? I call these delicious beauties Rolls because they remind me of quick dinner rolls. They are bready, studded with apples and with a hint of cinnamon. You could also call them buns. They aren’t really sweet. They aren’t supposed to be sweet. They are made with a pancake-like batter that is made thicker with more flour. 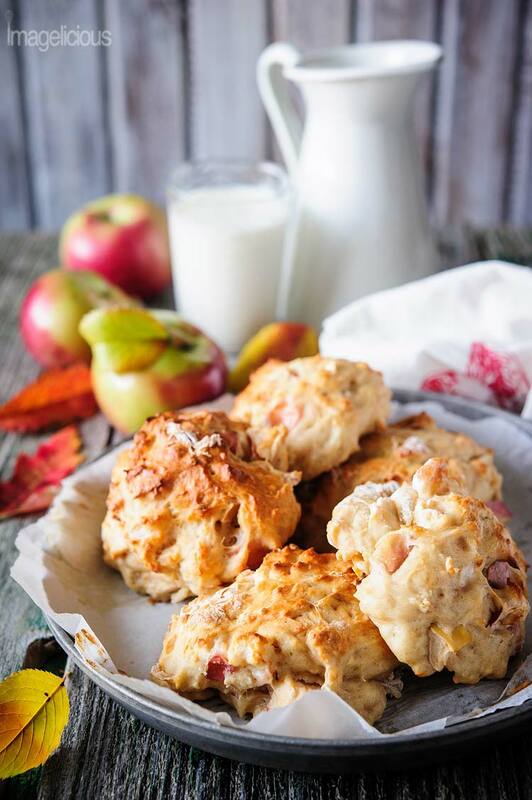 These delicious Apple Pie Rolls (or Apple Pie Buns) are more like little breads than pastry! My batter is too runny, what do I do? Add more flour, so that the batter is of consistency that can be shaped into rolls. If you don’t want to add more flour (perhaps, you ran out), pan-fry the batter into delicious apple pancakes! If you don’t believe how easy this recipe for Apple Pie Rolls is, check out my video. You just need to measure, mix, and bake! How do the Apple Pie Rolls taste? I made these Apple Pie Rolls twice in three days, I liked them so much. But I still have to warn you. My husband said that they are “doughy” which made no sense to me since well, they are rolls, so they are supposed to be like a bread sort of. The batter is very similar to a pancake batter, but I’m letting it rise and bake and puff up in the oven. There are more apples than the “bread” part and I like it this way. Also, the actual bread part isn’t too sweet, I put very little sugar on purpose as my apples were very sweet. For a sweeter version of these rolls add another quarter cup of sugar. The batter is very sticky. I used spoons to form the rolls once and then the other time I formed the rolls with oiled hands. Hand shaped rolls are prettier, but they take longer to make and are quite messy. In a large bowl combine the yogurt, egg, sugar, cinnamon and mix well. Add the chopped apples and mix. Add the flour and baking powder and mix until the flour disappears. Do not overmix. Line a baking sheet with parchment paper and either shape six rolls with oiled hands or use two spoons to shape the rolls. Bake for about 35-40 minutes. Or until they turn golden brown and a toothpick inserted in the centre comes out clean. I used sweet and small McIntosh apples chopped in about 1/2 inch pieces. I suspect you can use other apples too, but if they are not sweet then you may want to increase the amount of sugar. As I wrote above the bread part of the rolls isn't too sweet, so depending on how sweet you like your rolls you may want to add more sugar anyway. If the batter is too sticky, add a bit more flour. Could I maybe scoop these out with an ice cream scoop that got pam on it so it won’t stick? These sound delicious and I love apples but I can’t eat dairy or eggs. 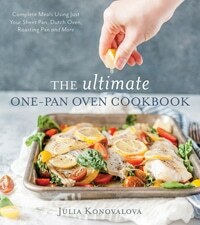 Would there be a way to make this recipe substituting with something else? Since both yogurt and egg are the base for the recipe I’d suggest trying a different recipe instead. I’m going to guess that you might be able to use vegan yogurt (sit or coconut perhaps) and maybe flax egg, but I’ve never tried that so I can’t say for sure if that would work. Maybe try a tea apple pie recipe with shortening in the dough to avoid dairy. 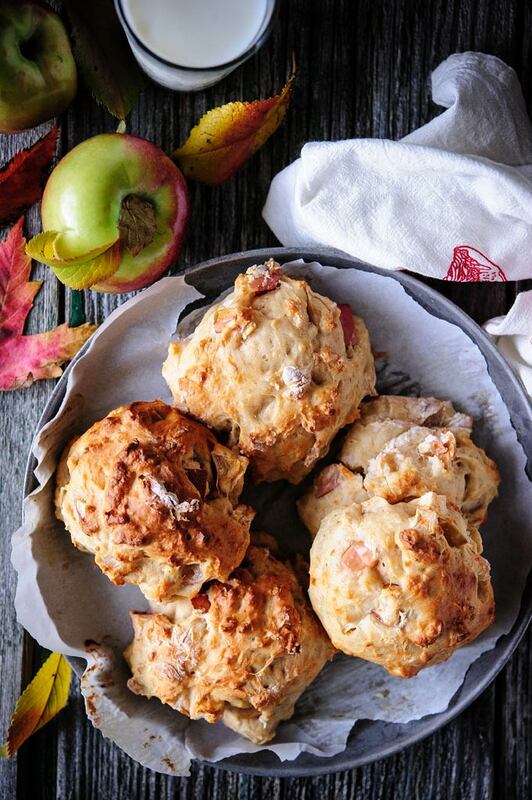 That looks sort of like a rustic scone…I will have to try it! Totally rude!!! I’m with you – hot from the oven with a smear of melting butter – yum!! These sound absolutely delicious…something like my "baba" would make. 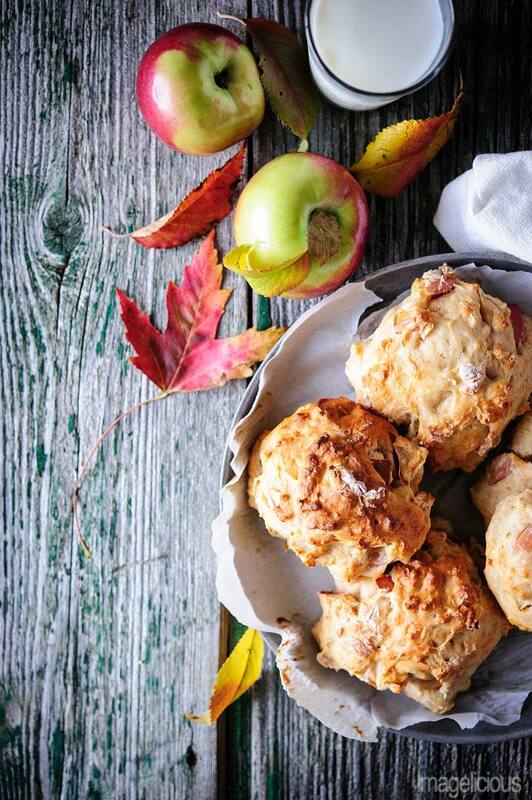 I love apple season, and there are never too many ways to bake and cook with them. This is my kind of breakfast food!! Wow! 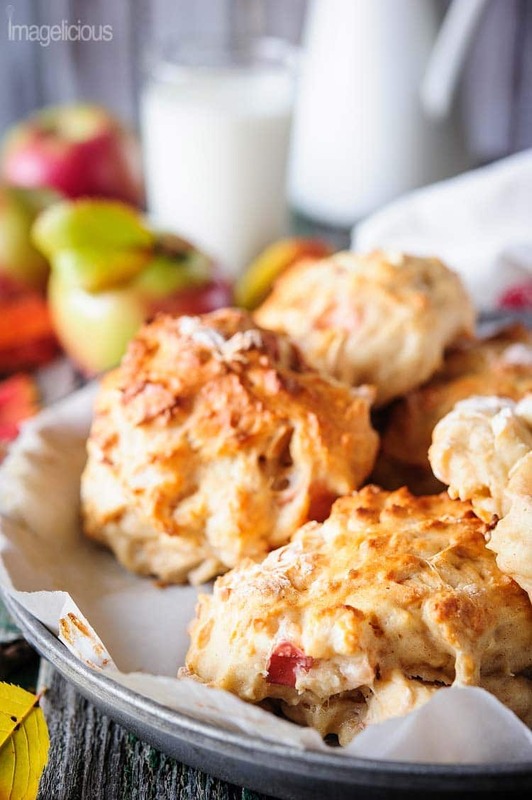 These apple pie rolls look incredible! 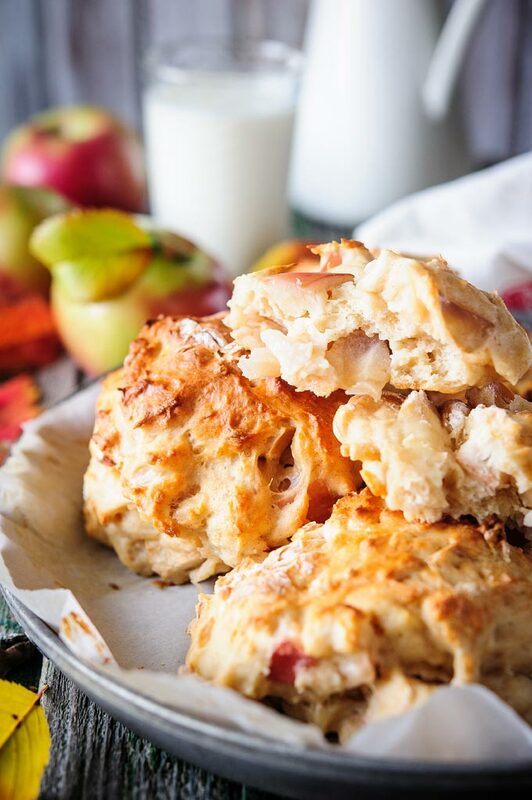 I love seeing all these delicious apple recipes mixed in with the pumpkin!